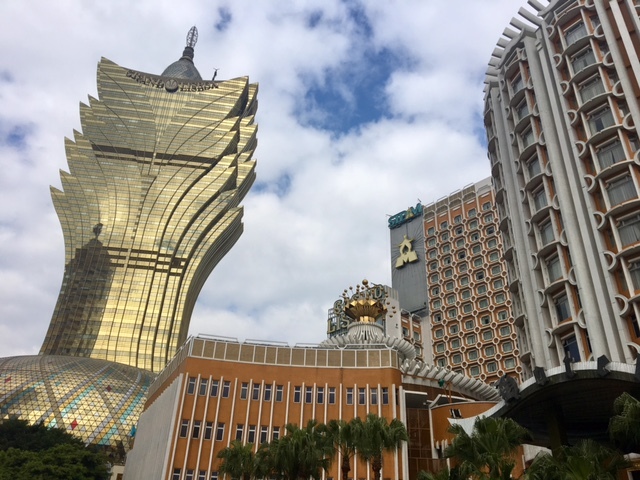 Known as the Vegas of the Orient, Macau makes for a delightful day trip for those visiting Hong Kong. It is part rustic, colonial Portuguese city and part flashy opulence in a way that only China can pull off. Like Hong Kong, Macau is a SAR or Special Administrative Region of China. It has its own currency and westerners don’t need a visa to visit, however just across the river you can definitely see mainland China. 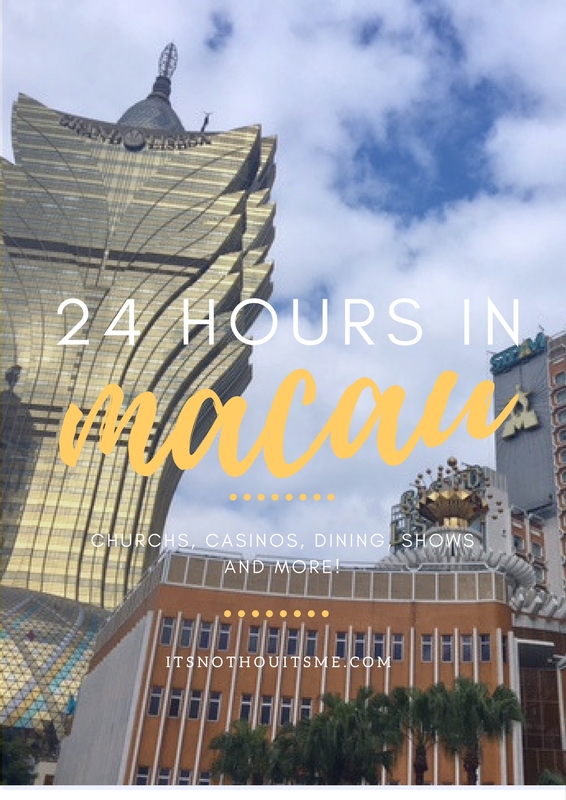 You can easily do Macau in 24 hours depending on how much money you want to spend in the Casino. Here’s how to optimize your time and have the greatest day! Wake up early and explore the old town that once was the heart of Portuguese commerce in China. Start your day off with a visit to the ruins of St. Paul’s Church. Climb the massive stretch of stairs and admire the façade of the Catholic Church that burned down over 100 years ago. Take a hike up the hill and see the Ma Hong Fort. From here you can see across the river and into Mainland China. Next, stroll down the streets making your way to other Portuguese sites such as St. Lawrence Church and St. Dominic’s Church. On your way, be sure to taste test and sample all of the Portuguese inspired Chinese cookies from vendors lining the streets. I ended up buying a package of sesame candy and sesame cookies. Macau is also known for their jerky. You’ll see vendors holding large sheets of it and cutting off samples for people to try in the streets. Another thing they’re known for is an egg tart called Pasteis de Nata–grab a warm one to taste while you’re walking around. This part of Macau is so fascinating because the signs are all written in Portuguese (and Chinese). There are brightly colored buildings, flower boxes, palm trees and cobblestone streets. While I have never been to Portugal, it doesn’t take much from the imagination to picture yourself in a colonial European city. As you get lost in the streets, you are definitely transported away from the traditional Chinese city bustle. After enjoying the quaintness of the Portuguese country, head to Venice, I mean, the Venetian for lunch. 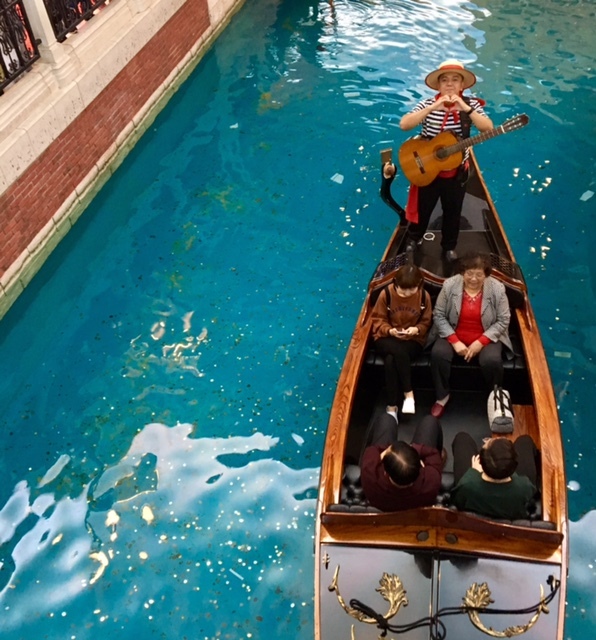 Get transported from Portugal to Italy and stroll through the Italian villa façade mall and maybe catch a gondola ride, yes a gondola ride, through the hotel. The boats men even serenade! 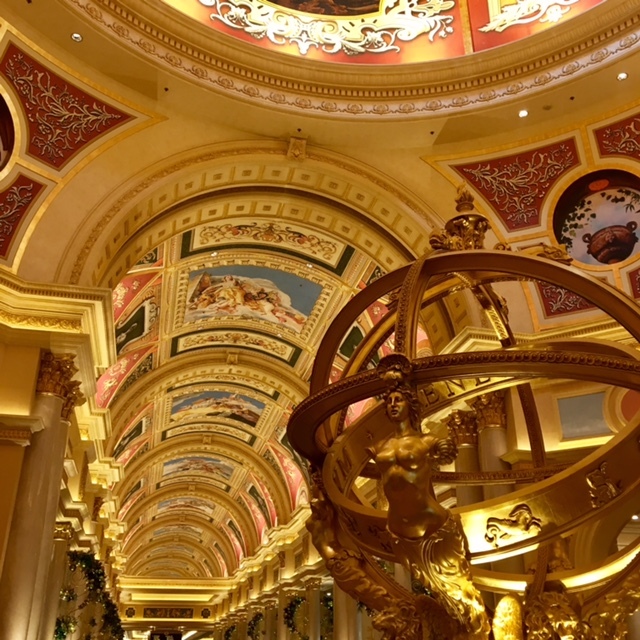 Inside every casino, there is a massive luxury mall, restaurants, shows and more. I recommend heading to the Venetian for lunch in their food court. Asian food courts are amazing and filled with high quality, cheap, large portions of food that are a zillion times better than anything you could find in America. Pei Wei move over. 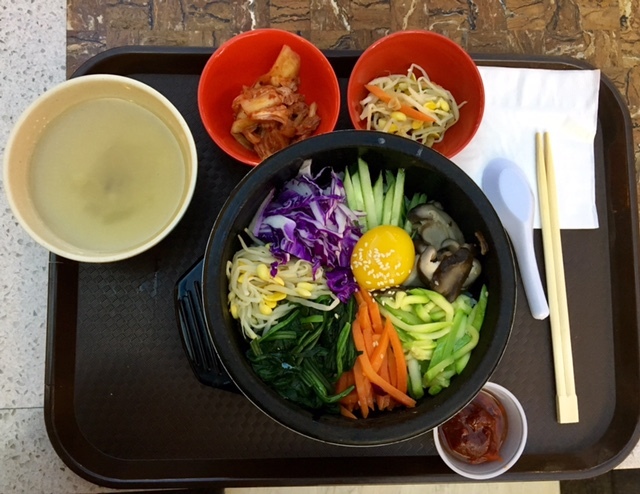 I had an amazing Korean lunch that was served on a cafeteria tray but came with several ceramic bowls filled with traditional accoutrement and a hot stone bowl with my main rice and veggie meal. Luxury shopping options are abound in Macau. You can play a drinking game and take a shot every time you see a Prada. I’m pretty sure I saw three of them inside the Wynn. If you don’t leave with a designer bag it’s not their fault. There are plenty of options for window shopping and spending money in that city—without even hitting the casino! 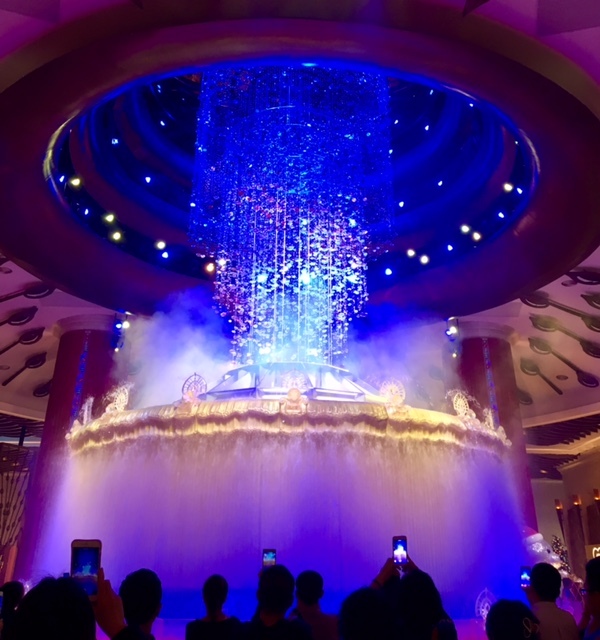 If you’re looking for a slightly cheaper way to spend the afternoon, head over to the Galaxy Hotel and view the peacock water fountain show in their lobby. It’s gaudy and over the top and a nice way to spend 15 minutes. One thing that I noticed was different in Macau than Vegas was that there are no strippers handing out flyers on the streets. Not saying this isn’t present in the city but it’s definitely not as in your face as in Vegas. At night, I highly recommend walking over to the City of Dreams and getting tickets to see The House of Dancing Water. 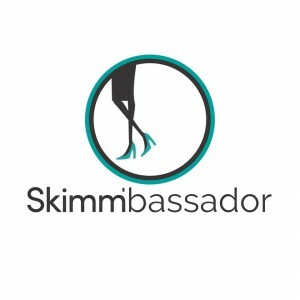 It’s like Cirque du Soleil and full of incredible performers who flip, twist and dance their way through incredible gymnastics and stunts off diving boards, trapezes, and swings and more. It’s mesmerizing, breath-taking, and terrifying at the same time as the performers jump and dive from incredible heights. Super cool show that’s a once in a life time experience to see! After we saw the show, the night was ours and we grabbed tapas at a restaurant inside the City of Dreams hotel–there really is no shortage of cuisines in Macau. If you’re the gambling type, there is also no shortage of casinos in the area and you can easily pass the remaining hours of the day in one of the city’s finest money grabbing establishments. We stayed in the Venetian and it was quite comical trying to get to our hotel room without passing through the casino floor. The building is built like a maze! To get to Macau, we took the Turbo Jet Ferry from Hong Kong. It cost $164 HK per person. When booking, you make a reservation, but you can ride standby and go a bit earlier if you want. Macau accepts Hong Kong dollar bills, but only sometimes accepts the coins. They often give back change in a combination of the two currencies, so be careful if you’re looking to head back to Hong Kong! 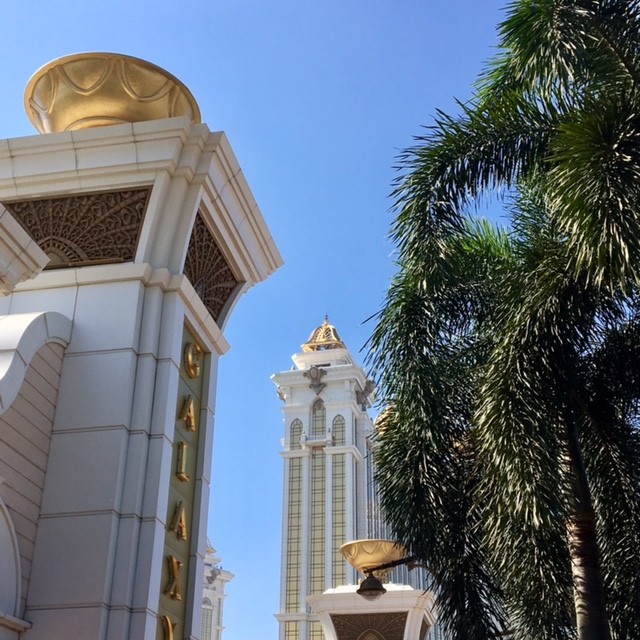 Make sure to spend all your Macau money before heading back. 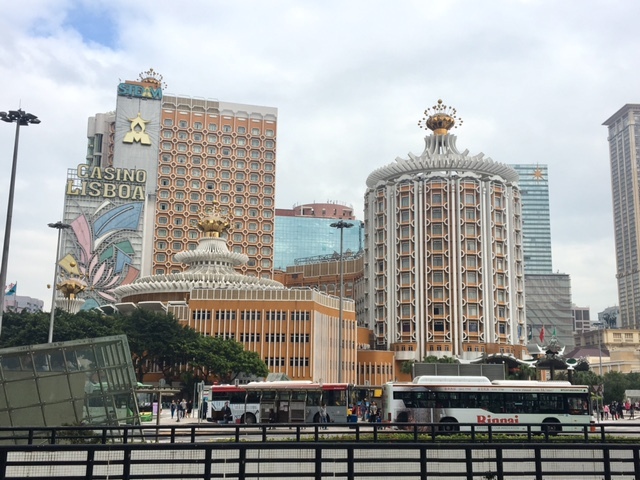 You can take a free bus between the old and new Macau casinos. They pick up across the street from the Wynn: Starworld and Guo Hang Holiday Travel Company (drops off at the Galaxy). Read on HotelsCombined’s How to get to Macau from Hong Kong: A Family Guide for more travel and accommodation tips in Macau. Tags: Asia, Casinos, China, City of Dreams, Hong Kong, Macau, Portugal, The Galaxy, The Venetian, Vegas. Bookmark the permalink. Yes! It’s definitely not their fault if you don’t buy a designer bag in one of their multiple/ duplicate designer stores, all located in the same hotel. You have to see it to believe it.